Well, it's almost over. Yesterday was the last day my "baby" will ever step foot in another class at his school. His graduation ceremony from High School will take place this weekend. Where has the time gone! One day I'm napping with him and Scooby Doo and in the blink of an eye he's posing for me in his junior high football uniform. He's traded his longer locks and braces for a shorter cut and a cap and gown... and a beautiful smile that lights up my world. He is a young man now. I can no longer cradle him as did when he was my little boy. Yet he will always be my little boy. The son who brought such joy to his parents' life. He is smart, and funny and has always been surprisingly wise beyond his years. His strength is inspiring. His mouth sometimes annoying. He has not always been a perfect kid, but he's been a pretty darn good one. He is, still my "little boy." I prayed over that little boy when he was yet to be born. I now pray that God will direct him and that he will follow the directions. I can't wait to see what God has planned for him. But today, it's tears that I'm shedding for that little boy that can now only be found in photo albums and in the memories locked away in my mind. How can it be that five years have gone by already? Though our lives came to a screeching halt on May 4th, 2010, at the same time I wonder where all the time went. How has it been five years already? It’s somewhat of a mystery how time can stand still and fly by at the same time, but it has. Five years ago today I had not yet emerged from the induced coma. My body still recovering from the trauma it had recently gone through. It was so long ago and yet it seems like just yesterday. Today is Mother’s Day. Five years ago I couldn't hear my son wish me a Happy Mother’s Day and I was unable to honor my mom. I was in the ICU on a respirator, soon to be awakened from a peaceful sleep. It is a time of which I have no recollection. As I think back on that year, my heart is overflowing with gratitude. It was a challenging year to be sure. It was also a time of spiritual awakening and growth. Not just my own but for my husband and for my mom. Both for whom I had been interceding on their behalf. God is so good! - In spite of the constant battles Satan forges against us, God is good! My husband could have been a widow. Our son could have been orphaned. My mom could have be devastated by the tragic loss of another child. But it was God who was victorious. He shielded me from the bullets when I was in satan’s crosshairs, deflecting them and preventing them from causing any permanent damage. He guarded hearts against the anger and bitterness satan would count on as his backup plan. He preserved life and faith my marriage and my family. He demonstrated His love for me through family, friends, and even through strangers interceding on my behalf and providing for our needs. He blessed me with my own private time “in the garden,” alone with Him. The twenty days in the hospital and the following months of recuperation allowed me to grow closer to God than I have ever been in my life. Lying in bed with my Bible, my pen and my paper, through His Word, God showed me His Truth. He revealed to me why things had to happen the way they did. And even though I was medicated for the first two months He gave me the desire to document my experiences. That “terrible” time brought me into His presence. I’m sorry for the despair the shooting caused my loved ones. I’m sorry for the loss our family has suffered as a result of it. My heart aches because of the absence in our home and because my son doesn’t have his dad here for him. I pray that these heartaches come to an end soon and that God will intervene (yet again) and bring him home to me. I surrender my life's story to Him. It is His to write and take wherever He wants it to go. My feelings are conflicted in heartache and joy, however. - Heartache over the unnecessary and ongoing loss. Joy in the assurance of salvation for those I love. Gratitude for all God has done and all He is going to do. Praises to His Holy Name! I will sing of His love forever! As a mother, my first desire is to know my child has accepted Jesus as Savior. Following that is his health and safety. Also at the top of my list of desires for him is that he is loving, caring, and happy. I hurt when he hurts. Whether it is physical or emotional, ‘I feel his pain.’ I would like nothing more than to protect Him from all the pain inherent in living in this world, but I know that is an unrealistic expectation. Pain is generally thought of as a bad thing, but that is not always the case. If we could not feel pain we would not know to remove our hand from a hot surface. If Jesus did not suffer the pain of our sins we would be lost for eternity. How God, who loves far beyond my imagination and capacity to love, could endure watching His Son suffer in order for us to be saved, defies human comprehension. If we are wise we grow as a result of painful experiences and relationships. Difficulty, pain and heartbreak are part of life. Jesus tells us that, in this life, we can count on having trials. When we trust in Jesus, we can be over comers. We can grow and be joyful in all things, because of what He has accomplished on our behalf. Lord, may my child’s trials in this life be minimal and his faith be limitless. Psalm 84:6 TLB 6 When they walk through ﻿the Valley of Weeping, it will become a place of springs where pools of blessing and refreshment collect after the rains. Crash!! Reaching into the cupboa﻿rd I ﻿b﻿umped my treasured coffee mug. ‘Oh NO!!!! !’ I yell as I reach frantically to stop the inevitable result. It bounced off the edge of the counter before landing on the kitchen floor. My heart, along with the handle on that mug, was broken. My eyes burned as they filled just enough for two salty streams to trickle down my face. I am far too mature to have burst into tears. At almost fifty-two, I have lived long enough to see far too many real tragedies. Undoubtedly, there are those who have experienced more tragedies than I have. But I am certain I have lived through more than my fair share of personal tragedies. Certainly too many to be overcome with grief over a simple coffee mug. It is not, however, just any old coffee mug. It is a treasure from the past. The mug has no significant material value. It is not an heirloom passed down through generations. It was probably mass produced for only pennies a piece. In primary school, the gifts at Santa’s workshop cannot be expensive. Santa’s workshop isn’t about the monetary value of the gifts as much as it is about the children having the opportunity to ‘shop’ for gifts to give to those they love. We can’t help but laugh remembering the very first gift Austin purchased for me from the workshop.... a car sponge. (What?) I have NO idea what was going on in his 5-year-old mind that would possess him to give that to me. Christmas day he had no idea that I was completely puzzled by his selection. He just knew that I thought it was the best gift ever. The gift was the joy - bringing us laughter over the years as we wonder what in the world he was thinking. The next Christmas thinking he may continue with that theme, I wondered if I would unwrap my gift to find a wire brush for my car tires. No, not this year. (whew!) My sweet boy melted my heart this time. 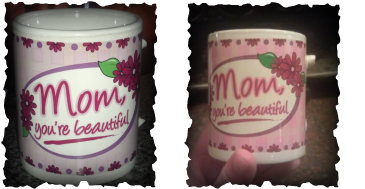 It was a ceramic mug that said ‘Mom, you’re beautiful!’. It would be the first time that mug brought tears to my eyes - but not the last. Through the years, for different reasons, I’ve had tearful morning coffee as I re-read the words on the side of my cup. Happy tears for the memory... sad tears at the thought of my baby growing up... tearful prayers for God’s protection over his life. As I picked up the broken pieces from the floor, I thought those would be the final tears I would share with that mug. I just couldn't toss it out though. Call me a hoarder if you will but it was only the handle. The memory, the mug, and the message were still intact. It will no longer be used to sip morning coffee. I placed it on the shelf next to the tiny ‘I love you Mom’ flower pot - another treasure from the past. There it rests, with two rough pieces protruding from where the handle used to be. My son came home the other day from a friend’s house. He whipped out his phone excited to show me what he found. “THIS - made - my - day... It was awesome!” Before he showed me, he explained that, while visiting at a friend's house, someone asked him to get a glass from the cupboard. Intrigued, I wondered what could be so ‘awesome’. Looking at the picture, I saw what appeared to be my cherished mug. “That is unbelievable!” It looked almost identical to the mug that I could not throw away. I must admit - I was a bit amazed myself. The one remaining handle part protruding from the side just a bit bigger than on mine. The difference is only evident, however, when pictured side by side. Jokingly I asked, "How did my coffee cup get in Ellie's cupboard?" “I know, right?” His big smile revealed his pleasure at my reaction. My heart stung with pain due to my careless handling of my treasured Christmas gift. I stored it in an over-filled cupboard. My 'baby' gave me a meaningful gift. I kept it with all the other dishware that I had accumulated over the years. It held infinitely more value than the rest, but I didn’t behave as if it did. I treated it as 'ordinary'. Somehow the pain I brought on myself evolved into shared smiles of amazement in that moment. Starting out we are given a beautiful life. The life God planned for us. Then we can manage to take it for granted, treat it as ‘ordinary’, and sometimes we end up ‘breaking’ it. We may not intend it, but we become distracted. We begin to take our relationship with God for granted. We fill our lives with other ‘stuff’ and then end up pushing Him out. - Then we end up breakin﻿g our relationship with Him. 2 Corinthians 4:16-17 NLT 16 That is why we never give up. Though our bodies are dying, our spirits are being renewed every day. 17 For our present troubles are small and won’t last very long. Yet they produce for us a glory that vastly outweighs them and will last forever! Thank You God that You can use our broken lives. The pieces may be broken. There may even be pieces that are beyond repair. He﻿﻿lp us - help me to give You what I have left. I know you can bless our lives for Your glory. When we offer our lives You can transform us, no matter how bad our deteriorated condition may be. Looking down, I see your eyes closed and your tiny little hands clasped. Are you praying? Do you already have a special relationship with your Heavenly father? You are only one month old yet it warms my heart to believe that you do. Could this be God's way of letting me know that He had heard my prayers for you – even before I knew for sure that there would be a 'you'? I so wanted my child to have a seeker's heart. More than a year has passed. As they wheel you to the front of the sanctuary for the play, in the wagon full of Christmas baby-angels, your smile is beaming and you look so happy to be dressed in your red garland-trimmed white robe. I pray that you keep that happy innocence. I pray you continue to bless others as you have blessed the daycare workers with your sweet disposition. You are three years old now and it is difficult to hold back the tears as you respond to Miss Marcia's request to come to the front of the church to sing with her one Sunday morning. Being your pre-school teacher, she knew how sweetly you could sing. Completely unafraid, you sing along just as she taught you.... “Blessed be the name of the Lord, He is worthy to be praised and adored...”. It is amazing to me that you are so calm, so uninhibited... so unlike me. Again, I am reminded of my prayers for you. I pray you continue to have that boldness for the Lord. Though church attendance drops off and there are few attending Sunday School, you continue to go and participate. But I can see that your attentions and enthusiasm are turning in other directions. You are blessed with athletic ability and sports are becoming a big part of your life. I pray that you recognize it is God who blessed you and that you will give Him the glory... and that you won't forget Him. At thirteen, I am so proud and thankful for the strength and grace you demonstrate in the face of unimaginable trauma. With your Dad now in jail and after enduring days of uncertainty as you were told I may not live, you choose forgiveness. God knew what you would have to endure. He knew that it would take a very special child to endure it. You are now a young man. Many warned me about the dreaded teenage years. Convinced that I would see no change, I am surprised when my sweet boy has indeed become that somewhat surly teenager. I know God is guarding your heart though. I know this transition is supposed to be part of becoming your own person. I pray that just as you refuse to back down on the basketball court, that you will not back down when your faith is challenged. And that you will be, not only a leader on your team, but a leader on God's team as well. I pray you are able to boldly articulate a defense of it that is both intelligent and gracious... Souls depend on it. I pray God will continue to speak to the heart of my sweet praying baby boy, and that your life and your faith will continue to bless others and bring glory to Him. We pray for our children. We raise them in the faith. But as they grow into adulthood they will face assaults on that faith, both subtle and blatant . There is a serious problem of our youth leaving the church. Crossexamined.org is a non-profit organization that speaks to young people on campuses across the nation, reminding them of their faith. God is using Frank Turek and his team to equip young Christians to defend their faith. They show them why they can believe, and they teach them how to defend what they believe. If your heart is burdened for young people today, and as you feel led by the Spirit, I urge you to donate today to this very important ministry. It is imperative that we don't lose the children that we have spent our lives praying for.